Located in southeastern Europe, Albania retains influences of all major European and Mediterranean civilizations. One of its most notable cities, Gjirokastra, is situated in the Drino valley, the richest archaeological area in the country. Dating back to the middle Bronze Age, its historical backdrop has remnants of the Byzantine period, a well-pronounced Ottoman influence and elements added during the Communist period. The Historic Centre of Gjirokastra has been inscribed on the World Heritage List since 2005 and is of rich architectural and urban value. It includes several types of constructions, such as social and public buildings, places of worship, as well as residences, all harmoniously composed in an outstanding historical urban landscape. The core of the Centre is the old bazaar with shops found in parallel lines, representing an urban character typical of the 17th and 18th-centuries. The historical and panoramic cityscape is completed by a surrounding protected area, comprising 8 neighbourhoods, which acts as a buffer zone. A controversial Bypass Road project has recently been approved by the national and local authorities in spite of the notable absence of any management or transport plan. The development will seriously damage the structural and visual integrity of the Centre, which is the essence of the outstanding value of the site. Moreover, two vernacular buildings will be demolished. Out of 615 monuments of Grade I and II status located in the Historic Centre of Gjirokastra, more than half are subjected to illegal or out of context constructions, while 169 are in critical condition or risk of collapse, according to a study published in 2016.
i) The national draft law ‘On cultural heritage and Monuments’ has not yet been adopted and there is no progress in the development of an overarching Integrated Management Plan for the site, although it appears as a fundamental and urgent need for its safeguarding. ii) The carrying capacity and scale of the Bypass Road project should be re-assessed as regard to the real need for transportation and to minimise its potential adverse impact on the integrity of the site. iii) The moratorium on new constructions within the property and buffer zones should be maintained. 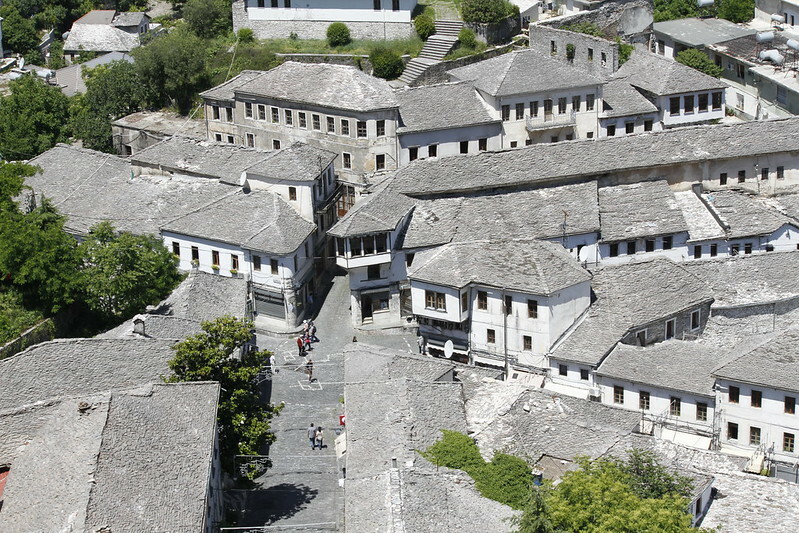 The nominator of the Historic Centre of Gjirokastra to the 7 Most Endangered programme is the Gjirokastra Foundation.